Aluminum bottles have many sound characteristics that make them a viable choice for packaging products in an array of industries. 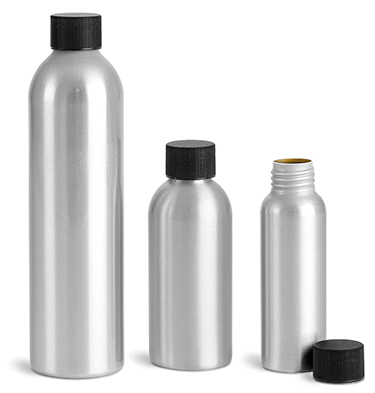 SKS provides many different dispensing and non-dispensing caps to match these aluminum bottles for a finished, polished look that is also functional for long term use. Aluminum is an abundant metal from the Earth's core, and is one of the most commonly used metals, with practical applications in many industries. Aluminum is recyclable and can be used for production indefinitely without loss of integrity. Many new aluminum products are produced from aluminum that was created decades ago. Manufacturers choose aluminum for packaging due to its lightweight, yet durable construction and its high level of resistance to corrosion. Aluminum bottles are BPA free and effective barriers against UV rays for light sensitive products, due to the opacity of aluminum. Aluminum bottles sold by SKS feature a multi-layered construction, providing a superior and versatile choice for packaging your products. The aluminum bottles have a polyester/amino outer coating as a preventive measure to assist in the reduction of scratching during use. The outer coating also provides a smooth surface for labeling and other decorative applications. An inner coating is also sprayed into the aluminum bottles, comprised of an epoxy-phenolic solvent base. This inner liner is gold in color and resistant to acids, phenol and many other chemicals. The epoxy-phenolic coating acts as a non-reactive barrier, allowing products to be packaged for longer periods of time with fewer complications. While this is a universally used solvent base for inner coatings, SKS highly suggests testing your products with these aluminum bottles to confirm compatibility. The Cosmo round aluminum bottles can be easily gripped while dispensing, and fit attractively on shelves or within a display. There are three sizes available, including 80 ml (2.7 oz), 120 ml (4.1 oz) and 250 ml (8.5 oz). All three sizes of the aluminum bottles have the same 24/410 neck finish, providing compatibility with the same variety of caps for each size. For example, if you choose to purchase each size of the aluminum bottles in bulk quantities, all sizes are compatible with our aluminum PE lined caps. Be sure to browse the large selection of non-dispensing caps with cap codes of E and F to create the pairing of your choice. Our aluminum bottles are compatible with white, black and natural ribbed sprayers. Kits featuring smooth fine mist sprayers are also sold in white, black for a variety in purchasing quantities. 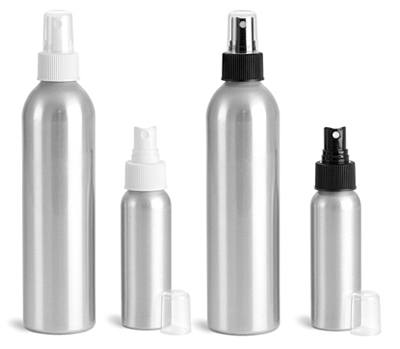 Aluminum bottles with fine mist sprayers could be used for products including hair spray and scents for the body and home. Lotion pumps are a sleek dispensing option when your product line includes high viscosity items such as lotions, creams and gels. SKS has black and white lotion pumps available as kits with aluminum bottles or sold in bulk. These lotion pumps dispense .5 ml of product per stroke and can be locked to help prevent unwanted dispensing. 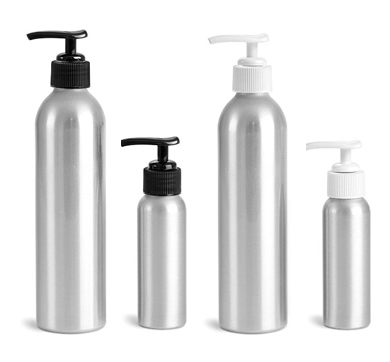 Aluminum bottles are extraordinary containers that can be paired with non-dispensing caps, lotion pumps, fine mist sprayers and mini trigger sprayers. With their silver color and soft shoulders, aluminum bottles can be easily integrated into a product line with plastic or glass bottles.